A field called Castle Close acquired in 1968, revealed a circular feature, which turned out to be the remains of a prehistoric round house. Ten years later in 1978 pottery sherds were discovered during ploughing. As work continued on the farm-land being reclaimed, a house built and valley garden created, worked flint tools began to be discovered. As a result of all the finds Mr Hadley was anxious that parts of the farm should be excavated and from 1978 a series of excavations were undertaken by Mr Hadley, members of the Cornwall Archaeology Society directed by Daphne Harris, and George Smith from the Central Excavation Unit of the Department of the Environment. The Mesolithic Area known as the Rock Mound dated from hazel nut fragments to 5,550 - 5,250BC. 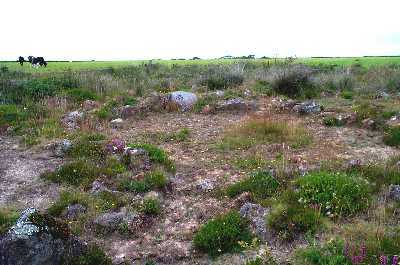 The Neolithic Site in North Pond Field dated from charcoal to 3,850 - 3,600 BC Cal. The Beaker Mound, yielding one of the best finds of Beaker Pottery in Cornwall, dating c1,540 BC. The Bronze Age Hut dated to c1,380 BC. The Iron Age area nearer the cliffs has not been examined in depth. 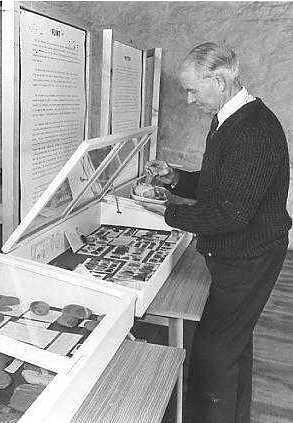 As a vast amount of material from all the areas was found, (over 48,000 Mesolithic flints alone) Mr. Hadley set up a small Museum in a barn on the farm to display the material, some items were also	deposited with the Royal Cornwall Museum in Truro. Chynalls Cliff Castle, Coverack NGR SW78601745. Lankidden Cliff Castle, west of Coverack NGR SW75571652. Goonhilly Downs, over 65 Bronze Age Barrows and the Late Neolithic / Early Bronze Age 'Dry Tree' Standing Stone NGR SW72562119. Trebarveth, Romano-British Salt Manufacturing Site, on the seaward side of the public footpath between Coverack and Lowland Point NGR SW79601931.